Only six months since Artix’s last Listener with its 12s 6d pre-decimal theme… oh! those were the days. I didn’t say so at the time, but I wonder how the kids of today would have coped. The same goes for distances like 3 miles 5 furlongs 17 yards 2 feet 3 inches (the length of my golf course)! This week, we had some word wrapping with entries entered cyclically (off the right or bottom and reappearing at the top or left). What’s more, two vertical bars were not shown… did he run out of ink? Just to annoy me, I’m sure, there were no clue numbers in the grid or against the clues. It didn’t take long to realise that practically no clue length given agreed with its possible entry. This, no doubt, was due to consecutive strings of letters being squeezed into a single cell. However, there were 25 across clues and 23 downs, and this came nowhere near agreeing with the grid. At least there were no misprints or wordplay obfuscation. 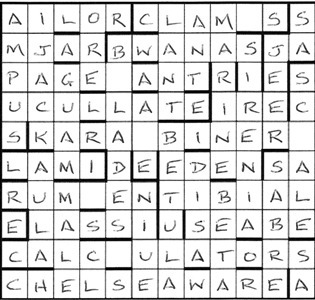 Before I went any further, I noticed that there was an 11-letter entry across the bottom of the grid which actually agreed with a clue enumeration of the same length. A bit of cheating via Tea, and CHELSEA WARE was slotted in, although part of me wondered if it would be there at the end of the solve. How annoying that it wasn’t in an easier position at the top of the grid. Luckily for my head, my armchair is some way from a brick wall, so it escaped much banging. As I expected from Artix, answers were teased from the clues very slowly. But, of course, they couldn’t really go anywhere yet, except on my notepad, since very little seemed to fit in my grid. When I eventually identified the director as Orson Welles, losing his second E to become WELLS, I saw how that might link up with CLAMBAKE and lose the BAKEWELL to give CLAMS. I was reminded of Franc’s puzzle back in March 2012 with its Battenberg cake theme. In hindsight, I don’t think this false lead held me up much. I slotted JEER in the top right corner together with JAMJAR (the best clue Traffic problem to cause vibrations in motor near Bow? (6)). A few more answers could also be entered and I was feeling confident. When PAGED and ENCHANT went into row 3, I could see that we were probably dealing with female personalities, probably from the entertainment industry. I had a grid that was over half full when KARATEKA and NAWAB gave me Kiri TE KANAWA and I remembered that all entries in the final grid would be real words. KARABINERS was thus the likely entry in row 5. This also finally explained one of the missing bars which would have fitted between the B of NAWAB and the I of INERT. (The other would go between the A and T of CALCULATORS in row 9.) I seemed to have too many clues floating around this central part of the grid. It took me a bit of time to realise that the Tip clipped, taking off the front (4) gave HORN which would disappear entirely to give Dame Sybil THORNDIKE. OMG! “Well, that’s a motley crew,” thought I, and for some time I had no idea what, if anything else, they had in common with the other crew made up of the three unclued nautical coves SAILOR, SEABEE and MARINE “and their mates”. It was good old Sybil who finally nudged me in the right direction. Unlike the others, I always think of her as Dame Sybil Thorndike, and a bit of Wiki-ing enabled me to verify that they are/were all Dames. This led neatly to that fine 60s musical by George Haimsohn and Robin Miller, Dames at Sea for indeed they were missing from the grid. Except that isn’t in the ODQ, at least not mine. However, the index did point me in the direction of “There is nothin’ like a dame. title of song (1949) in South Pacific“. I was surprised that we were not required to enter the song title or show under the grid. After all, it wasn’t actually necessary to identify this link in order to complete the puzzle. Thanks to Artix for another tough one. Getting to the final grid took from lunch until dinner! Identifying the Damely link and the Broadway musical took (despite my describing it so succinctly above) over an hour! This entry was posted on 17 July 2015 at 4:00 pm	and is filed under Solving Blogs. You can follow any responses to this entry through the RSS 2.0 feed. You can leave a response, or trackback from your own site. I’m that that the reference isn’t to the title of the song, but to the specific line near the beginning of the song: “What ain’t we got? We ain’t got dames!” After all, there are no dames.